So, I have gotten away from doing private sessions the last 6 months since "A Little Glamour" (my preschool, glamour shot business) has taken off! I'll write about that more in another blog, but one of the things I love about "A Little Glamour" is that I have preschools all over the Southwest and get to meet so many awesome people! I met Cheyenne out in Yuma through my work in the preschools there, and have photographer her beautiful daughter a number of times. 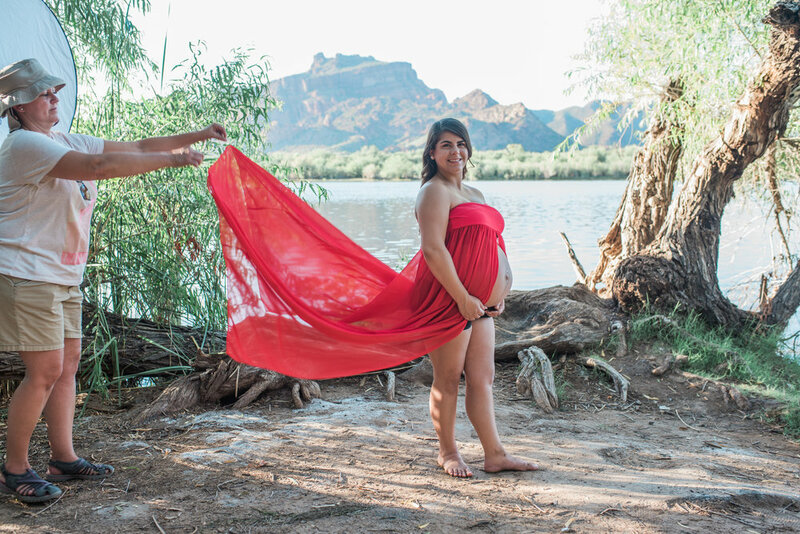 When I went a few weeks ago, she inquired about maternity pictures, and of course I jumped at the chance. She wanted something different than the normal "Yuma" spots where people go, and wanted some water for the shots, so I found a campsite close to Red Mountain, and where I live. I was so excited for someone to try the new dresses I got for maternity shoots! The black lace and red dress are ones that I have for sessions (also have white lace). Cheyenne was such a good sport and modeled several different dresses, but the red flowy one has to be my favorite! My mom was in town as well, so I put her to work as my assistant (i.e. lugging all my equipment around), and she did an awesome job with my "throw shots" for the red dress. I was able to put several pictures all together to get the thumbnail (and first shot in this blog) together in Photoshop. Cheyenne's boyfriend was also put to work holding the reflector when he wasn't in shots...thanks to all of you guys for all your help! Normally when I get home I upload everything to my computer and get back to it in a few days, but I stayed up late going through all of these because I was so excited! Cheyenne, Chris, and Aryia, I hope you love your maternity pictures as much as I do!